Well another “monster” snow storm is headed our way, and all I can think about is my golf trip to Florida. Brothers Randy (in picture) Brad, and family friend Norm Sauer, and myself are flying to Fort Meyers on Feb. 24th. We are going to get 5 days of golf in, and plan on playing several courses. Norm has a sister that lives in Fort Meyers who is letting us use her house while she goes on a cruise. Just today I went over to Hillsdale and retrieved my 4-wheeler from my lease property. It was buried in snow, but started right up for me. I couldn’t get to the tree stands, so they will have to wait till things thaw out somewhat. I was thinking about 75 degree temperatures, blue skies, and green golf courses all the way over there. Three and a half more weeks and I’ll be flying the friendly skies, or at least that’s the plan. I realize I can plan all I want, but many things could happen to alter those plans-like world unrest, bad weather, or even sickness, so I’m just hoping we can get a much needed winter break soon. Until then I’ll keep putting in the family room, and watching golf on T.V. What Would Little Red Riding Hood Do? This is a wolf track that we found just behind our bear camp in Marquette. Two years ago we had several wolves come into our bear baits. The Baldwin gang has seen them around their camp, and we have even caught a glimpse of them crossing the roads, as we traverse the Upper Peninsula. The DNR tried to have the wolf “delisted” as an endangered species just over a year ago, but the tree hugger’s, and animal rights activist got involved. The Federal Govt. caved in to their protest, so the wolf population keeps growing here in Michigan, Minnesota, and Wisconsin. Well there appears to be some good news on the horizon. Senator Amy Klobuchar from Minnesota recently struck a deal to expedite the removal of the gray wolf off the endangered species list. The U.S. Fish and Wildlife Service says this all should take place by the end of 2011, according to a press release from Klobuchars office. This all remains to be seen, as the Humane Society of the United States is already gearing up for a fight. The HSUS is the organization that runs all those “tear jerking” adds on T.V. with the abused dogs, woeful kittens, and many other heart wrenching photo’s of animals in various forms of distress. They are the richest “anti-hunting” organization in the world! Money pours into their coffers, as these adds work there intended purpose. Problem is, only a minuscule amount of money actually goes to helping stray dogs and cats, and the local Humane Society never sees a dime from them. Most of these well meaning donations go for the executives salaries, who’s main goal is to shut down our right to hunt. Michigan is a great state to hunt in. We have deer, bear, elk, and turkey, not to mention fantastic waterfowl, small game, and predator hunting. Thanks to our outgoing Gov. Jennifer Granholm we may soon add moose to that list. The Gov. signed a bill late last month supporting a (first ever) moose hunting season in the state. Now this does not mean it will be this year or even next, but it opens the door for it to happen in the not to distant future. An advisory council is in the works, which will work toward the goal of a sustainable hunt. The moose herd is another one of Michigan’s success stories concerning conservation practices in restoring wildlife populations in our state. The elk herd and turkey restoration are prime examples of what can be accomplished through sound wildlife management tools. It doesn’t seem like it was that long ago that we exchanged turkeys for moose with our Canadian neighbors. Many of those moose were transported in and around the Marquette area, and we now see evidence of their ever expanding habitat whenever we bear hunt. Not only do we have the Canadian transplants, but our own native moose population is on the rise. 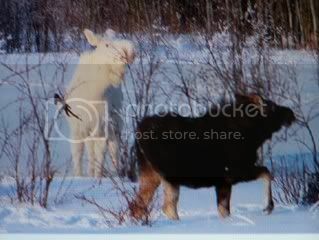 Moose have been spotted in almost every Upper Peninsula County. I’ve seen several around Blaney Park, Munising, Alger, and of course Marquette. When It finally does happen I hope I have a better chance of drawing a tag, than I do with drawing an elk tag. I’m “0” for forever on elk, and don’t think I can hold out that long on moose. No matter: it will be good to add the mighty moose (king of the deer family) to our list of success stories in The Great Lakes State. You keep coming back with pictures like this Darryl, and I may have to break down and buy that out-of-state license next year. That is if you’ll take me along. This elusive 170 class buck was caught on my brother Darryl’s trail cam in October. He has several different size bucks roaming his area, but this is the one he had his sights set on. This deer is a typical 12 pointer, with good mass, and nice long tine length. He’s not super wide (There’s other pictures of him) but he is without a doubt a once in a lifetime buck! As with most trophy bucks he would only move at night, and kept well hidden during the day. Darryl got a few more cam photo’s of this buck, and possibly a twin brother. There are two photo’s that look exactly like this deer, but one side (on the G-5’s) looks shorter-thus the possibility of a twin. Intriguing to say the least. Anyway this deer disappeared just before gun season, and Darryl begrudgingly settled for a lesser buck. Rumor has it that another hunter harvested this deer a couple miles from where Darryl had been seeing him. The rut no doubt had something to do with this bruisers demise, but hopefully there truly is a twin brother still roaming the area. The 8 pointer Darryl ended up taking with his bow is a very nice deer indeed. Little brother waited till just before gun season to down this buck, but the visions of a “Booner” still dance in his head. He’s hoping that next year this 12 pointers brother will materialize, and the quest will be on again. If your a dad, or grandpa, or uncle, or family friend and there are any “hunting age” kids within your sphere of influence, then find some way to introduce them to your sport. Take a look at the faces of these two youthful successful hunters! This is Tanner McElvany and his cousin Tristan Ansel. They are my “great nephews.” My brother Darryl’s grand kids. Now Tanners dad does not hunt, but grandpa sure does. Darryl has unleashed the “hunter” from within the spirit of this young man, and he is well on his way to many stellar hunting exploits. He’s just 12, but has a bow kill, a shotgun buck (see picture) turkeys, and geese in his families freezer. He’s also taken small game, and is always “up” for a chance to hunt with grandpa. This kid is the “real deal,” but he might not of been so, if grandpa hadn’t taken the time to nurture him. He’s been following Darryl in the field since he was old enough to carry his toy rifle with Papa. Tristan is another one of Darryl’s grand-kids, but his dad (and mother) both hunt. Of course the family times in the field are limited, due to work and family needs, so that’s where grandpa comes in. In this picture you see the two cousins with their first geese. Shot em in the air – no “sitting ducks” for these two. Grandpa says “Break them in right, and let em learn to wingshoot!” Tristan also is a successful turkey hunter, and is itching to get that first deer under his belt. Darryl has always said “If you take your kid hunting, then you won’t have to hunt for your kid!” There is an awful lot of truth in that statement. So if your fortunate enough to have a young potential hunter/huntress around you, do us all a favor-get em out in nature. Teach them about the “real” world where they can truly experience the full life cycle of their natural surroundings. I honestly believe that vegging on the computer, constant texting, and video games are stealing the heart and soul of many of our youth. Living in a fantasy land that is impersonal and sedentary can only led to problems down the road. You may end up a computer genius, but wouldn’t survive a day having to deal with what nature can throw at you. Speaking of training a child about hunting, camping, and all around woodsmanship-I must mention Tristan’s dad Derek Ansel. Derek is one of the top store managers at the huge Cabela’s store in Dundee Michigan. Just this last weekend he was flown to Minnesota to meet the founders of Cabela’s. Derek was named one of the top four (4) managers in all the country. His input on how to run a successful operation will help train up and coming future managers at the retail giant. Darryl you did a good job with your son, and all of us are proud of his accomplishments. Congratulations Derek-it couldn’t happen to a better guy. Dan Graham is one of my brother Darryl’s hunting buddies. I finally got a good picture of the bear he took this year, and the really nice 8-pointer he downed during gun season. I’ve bear hunted with Dan before, and have watched him shoot his bow. He is an excellent archer, and I knew if given the opportunity he would get his bear rug. Two years ago he had a huge 500 pounder hitting his bait, but only late at night. We have trail cam pictures of him that made Dan sit this bear out for several rainy evenings-to no avail. This year Dan and Darryl tried a different Upper Peninsula location and Dan scored on a nice bear. The fur was jet black and very long, and will make a beautiful mount. during our November gun season (shotgun zone) Dan downed a very nice 8-pointer. It had good mass and was one of those narrow high racks. Dan made a great shot on him after he had snuck in behind my brothers position undetected. When he strolled the edge of the cornfield, where Dan could get a shot, he popped him. The guys hunting this southern Mi. area (Made me swear not to tell the where-a -bouts) did very well. I have a few pictures of some of the nice bucks they took. Most hunters practice QDM, and the results speak for themselves. Congratulations Dan on your memorable year. Derek had a good year of hunting, as he downed a nice 8-pointer with his shotgun. Well it was an 8-pointer but one side was broken off, no doubt due to fighting. I’m not positive, but I think he took a doe with his bow also. He’s a crack shot with stick and string, and has his whole family into hunting and the outdoors. His wife even shot a monster turkey last year, and his oldest son Tristan has taken to hunting like a duck to water. Tristan shot his first goose this year, and also has a turkey under his belt. Derek is one of the store managers at Cabela’s in Dundee Michigan, which would seem to be a dream job for any outdoor enthusiast. The biggest drawback is during hunting season Derek is most needed at the store. He covets the time he’s able to break away, and spend it with family and the outdoors. Derek is a credit to his family, his employer, his community, and fellow sportsman. I am proud to have him as a nephew, but wish we could share more hunts together. Everyone needs a nephew like Derek! As an archer and bowhunter, how many times have you heard “I made a good hit on him, he shouldn’t go very far!” Honestly I hope you haven’t heard it a whole lot of times, and come up empty handed. In the 48 years that I have participated in this sport I will admit to loosing a few deer, due to a marginal hit. I have even lost a few That I know that arrow was right smack in the chest area. Dead deer, even if I didn’t find it! Well coyote bait anyway. Well my brother Darryl just gave me two pictures that kind of blew me away. Not all deer that take a “dead center” chest hit die, or are coyote fodder, or starve to death. In the two pictures I’m about to post you will see a young buck (minus his antlers) with about 8 inches of arrow shaft sticking out from his shoulder area. The second picture was taken a year later, and here’s this nice little 8 pointer, with the arrow still embedded in this healthy looking deer. I would assume that the broadhead struck the shoulder, and buried itself just far enough that it wasn’t coming out. Obviously there were no broken bones or any major organs penetrated, but these pictures show, once again, how resilient whitetail deer are. I would like to believe that more than a few deer are still going strong, even if we think “Man I hit him dead center!” Dead center sometimes is the shoulder area, and with a bow that’s a no-no. The ideal shot placement is the classic quartering away shot, and if the deer is broadside aim for the area just behind the front leg. I’m posting these picture for the benefit of the hunting community, so be aware of who you show them to. Deer are amazing creatures! What do you do when your snowed in for the day? As you can see from the picture I worked on the project I blogged about a couple days ago. I made the decision to add the turkey tail feathers, feet, and beard to the center of my cherry wood, and then add four of my deer racks. I was real pleased with the way it turned out, and it’s always nice to be able to “scratch” another project off my list. I have actually harvested quite a few turkeys, but have yet to shoot a coveted 12 incher. The one in the picture is 10-1/2 and I got one two years ago that was 11 inches. I’ve taken a number of 8-9 inch beards, and even shot a few Jakes. (with my bow) I put in for the second (no draw) turkey season, and my friend Britt says he is expecting a great year for birds. My nephew Scott Smiley is going with me this year, and we are both really excited. May can’t come soon enough.